Very nice shirt as usual. The ends of the collar seem very narrow. I like how that looks, it wouldn't choke me to wear it. How wide are they at the edge? 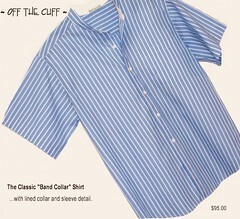 Yes, this band-collar narrows from 1" at the back to barely 1/2" at the button edge. It's a very distinctive look, and requires very precision stitching.